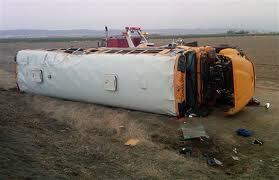 A school bus overturned on the morning of March 12, 2012 on a central Washington highway outside of Quincy, Washington, injuring dozens of children, including three seriously, before coming to rest at the edge of a field, authorities said. According to news reports, the bus veered off the road, overcorrected and rolled on Highway 281 just south of Quincy, Washington. The bus came to rest on its passenger side, and all 39 students on board suffered injuries of some kind, though most were minor scrapes, bruises and bloody noses, Martin said. Three children were in serious condition, but none of the injuries was believed to be life-threatening. One child was airlifted to the nearby city of Moses Lake, and two were taken to a hospital in Ephrata. The rest of the students went to the local Quincy Valley Medical Center, either for treatment or to be reconnected with their families. The driver apparently was not injured, and no other vehicle was involved. The Quincy School District covers about 450 square miles of farmland in central Washington’s Columbia River basin, which is home to thousands of acres of tree fruit, and potato and onion fields. The district serves 2,500 students. Martin said the cause of the crash was under investigation. Roads were bare and dry when the bus rolled. This incident renews concerns about students traveling on buses and whether buses should be required to have seatbelts for students. These students may have a claim against the school district for their injuries. You may contact our lawyers for more information at 866-377-0191.